The Worldwide Freezing Order (“WFO”), formerly known as a “Mareva Injunction”, has become an increasingly common feature of international trade disputes. In this article we examine some frequently asked questions about this useful tool, as we regularly advise clients on WFOs and on the committal proceedings which can result from disobeying one. 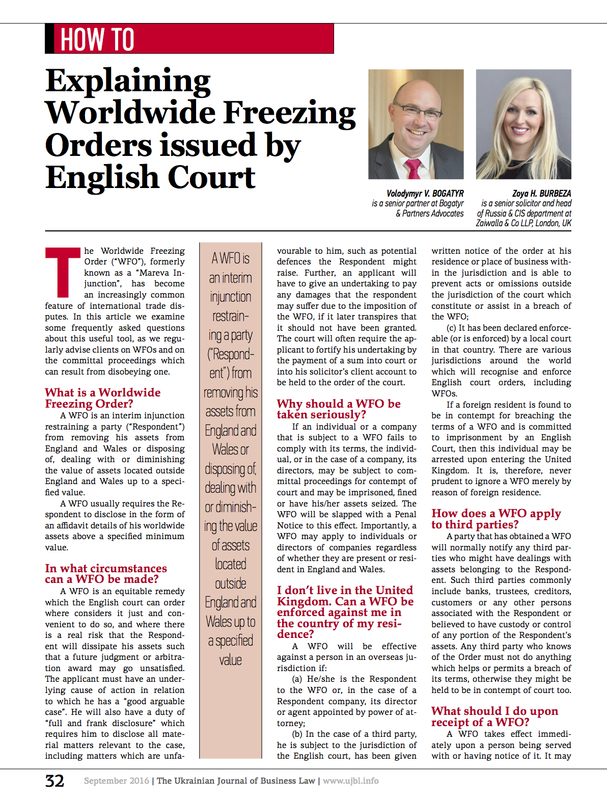 What is a Worldwide Freezing Order? A WFO is an interim injunction restraining a party (“Respondent”) from removing his assets from England and Wales or disposing of, dealing with or diminishing the value of assets located outside England and Wales up to a specified value. A WFO usually requires the Respondent to disclose in the form of an a davit details of his worldwide assets above a specified minimum value. In what circumstances can a WFO be made? A WFO is an equitable remedy which the English court can order where considers it just and convenient to do so, and where there is a real risk that the Respondent will dissipate his assets such that a future judgment or arbitration award may go unsatisfied. The applicant must have an under- lying cause of action in relation to which he has a “good arguable case”. He will also have a duty of “full and frank disclosure” which requires him to disclose all material matters relevant to the case, including matters which are unfavourable to him, such as potential defences the Respondent might raise. Further, an applicant will have to give an undertaking to pay any damages that the respondent may su er due to the imposition of the WFO, if it later transpires that it should not have been granted. The court will o en require the applicant to fortify his undertaking by the payment of a sum into court or into his solicitor’s client account to be held to the order of the court. 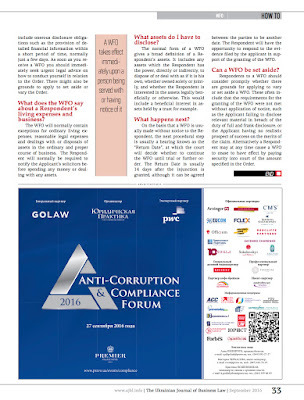 Why should a WFO be taken seriously? If an individual or a company that is subject to a WFO fails to comply with its terms, the individual, or in the case of a company, its directors, may be subject to committal proceedings for contempt of court and may be imprisoned, ned or have his/her assets seized. The WFO will be slapped with a Penal Notice to this effect. Importantly, a WFO may apply to individuals or directors of companies regardless of whether they are present or resident in England and Wales. I don’t live in the United Kingdom. Can a WFO be enforced against me in the country of my residence? (c) It has been declared enforceable (or is enforced) by a local court in that country. There are various jurisdictions around the world which will recognise and enforce English court orders, including WFOs. If a foreign resident is found to be in contempt for breaching the terms of a WFO and is committed to imprisonment by an English Court, then this individual may be arrested upon entering the United Kingdom. It is, therefore, never prudent to ignore a WFO merely by reason of foreign residence. How does a WFO apply to third parties? A party that has obtained a WFO will normally notify any third parties who might have dealings with assets belonging to the Respondent. Such third parties commonly include banks, trustees, creditors, customers or any other persons associated with the Respondent or believed to have custody or control of any portion of the Respondent’s assets. Any third party who knows of the Order must not do anything which helps or permits a breach of its terms, otherwise they might be held to be in contempt of court too. What should I do upon receipt of a WFO? A WFO takes effect immediately upon a person being served with or having notice of it. It may include onerous disclosure obligations such as the provision of detailed financial information within a short period of time, normally just a few days. As soon as you receive a WFO you should immediately seek urgent legal advice on how to conduct yourself in relation to the Order. There might also be grounds to apply to set aside or vary the Order. What does the WFO say about a Respondent’s living expenses and business? The WFO will normally contain exceptions for ordinary living expenses, reasonable legal expenses and dealings with or disposals of assets in the ordinary and proper course of business. The Respondent will normally be required to notify the Applicant’s solicitors before spending any money or dealing with any assets. What assets do I have to disclose? The normal form of a WFO gives a broad definition of a Respondent’s assets. It includes any assets which the Respondent has the power, directly or indirectly, to dispose of or deal with as if it is his own, whether owned solely or jointly, and whether the Respondent is interested in the assets legally beneficially or otherwise. This would include a beneficial interest in assets held by a trust for example. On the basis that a WFO is usually made without notice to the Respondent, the next procedural step is usually a hearing known as the “Return Date”, at which the court will decide whether to continue the WFO until trial or further order. The Return Date is usually 14 days a er the injunction is granted, although it can be agreed between the parties to be another date. The Respondent will have the opportunity to respond to the evidence led by the applicant in support of the granting of the WFO. Can a WFO be set aside? Respondents to a WFO should consider promptly whether there are grounds for applying to vary or set aside a WFO. These o en include that the requirements for the granting of the WFO were not met without application of notice, such as the Applicant failing to disclose relevant material in breach of the duty of full and frank disclosure, or the Applicant having no realistic prospect of success on the merits of the claim. Alternatively a Respondent may at any time cause a WFO to cease to have effect by paying security into court of the amount specified in the Order.